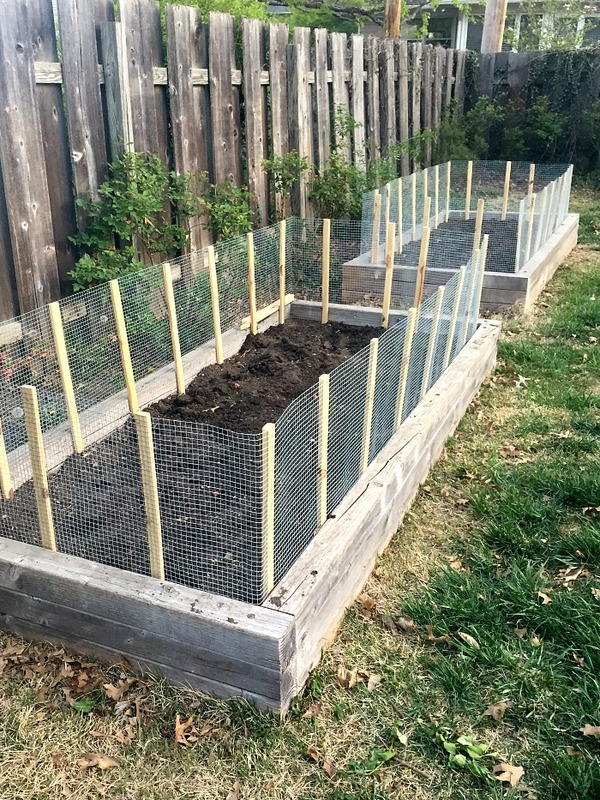 A couple weeks back, my mom and I busted out a quick and easy fence for my vegetable garden. No bunnies allowed this year! 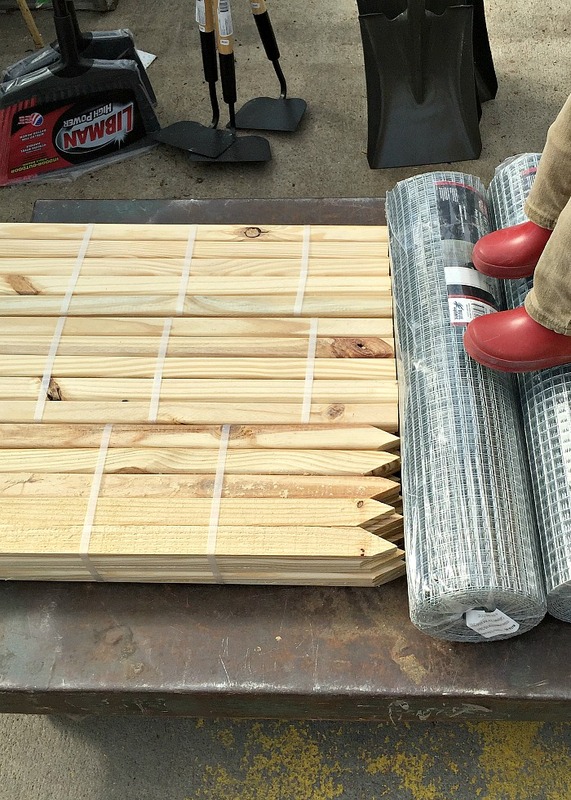 This fence was so simple and inexpensive to make; we didn't need any power tools or help from my handy husband (in fact, he was out of town) so I wanted to share how we did it. Staple gun - this project killed my cheapy plastic one, go for heavy duty metal or airless! 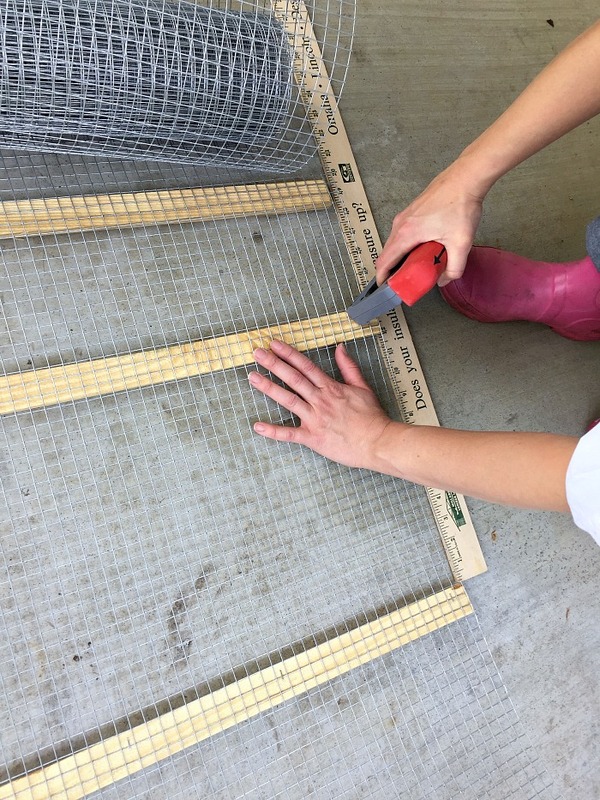 To make the garden fence, we unrolled the chicken wire a few feet at a time on the patio. Then, I slid a stake underneath, made sure it was straight and stapled it in place. I also measured twelve inches between each stake to ensure even spacing. Having my mom there to help was great because she wrangled the unruly wire while I measured and stapled. 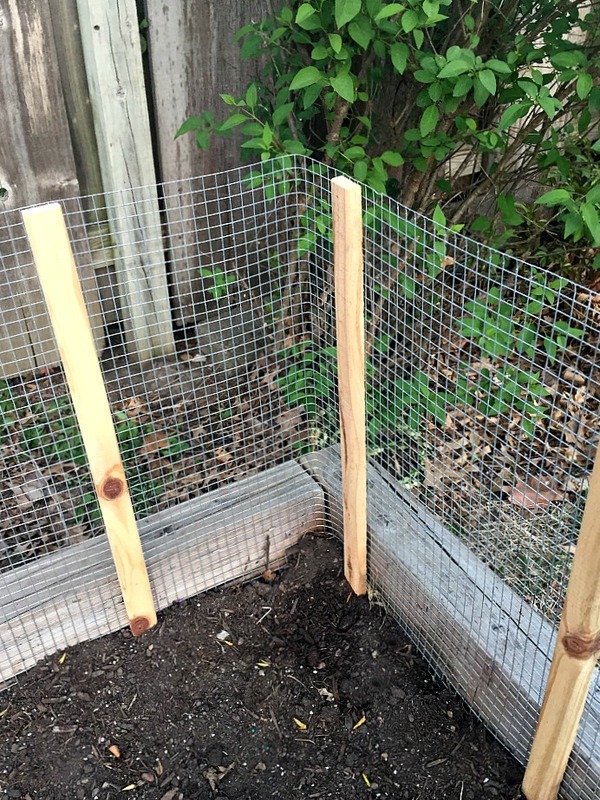 I continued along until the entire roll of chicken wire had a stake every twelve inches. Then, we dug out a little trench along the inside of the raised garden bed and set the fencing down inside it. Again, my mom wrangled the chicken wire and held it in place while I stapled it to the inside of the garden bed timbers. 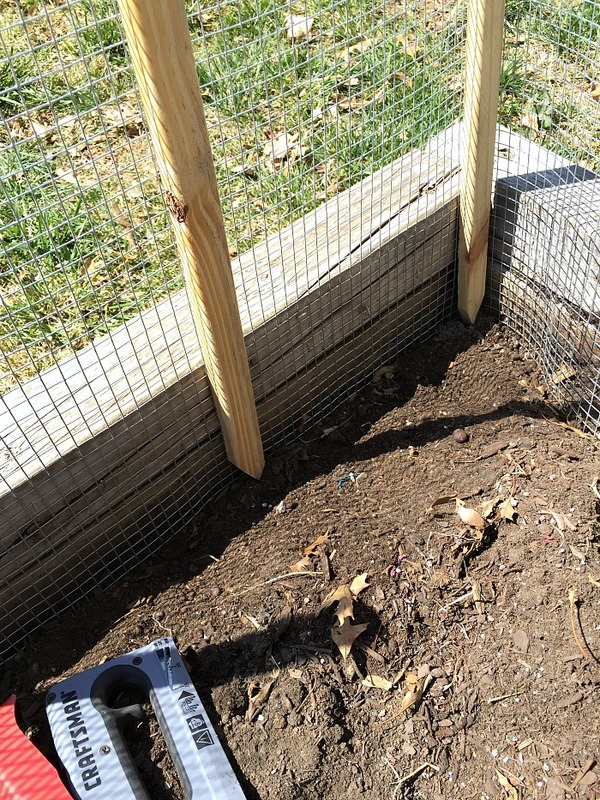 I crimped the chicken wire little at each corner to make it nice and flush. When the entire perimeter of the garden bed was fenced, I shoveled dirt back into the trench, and we were done! All in, the two fences cost about sixty dollars and took three hours to complete. It was hard work, but not rocket science, and I feel so proud that we were able to accomplish it on our own! 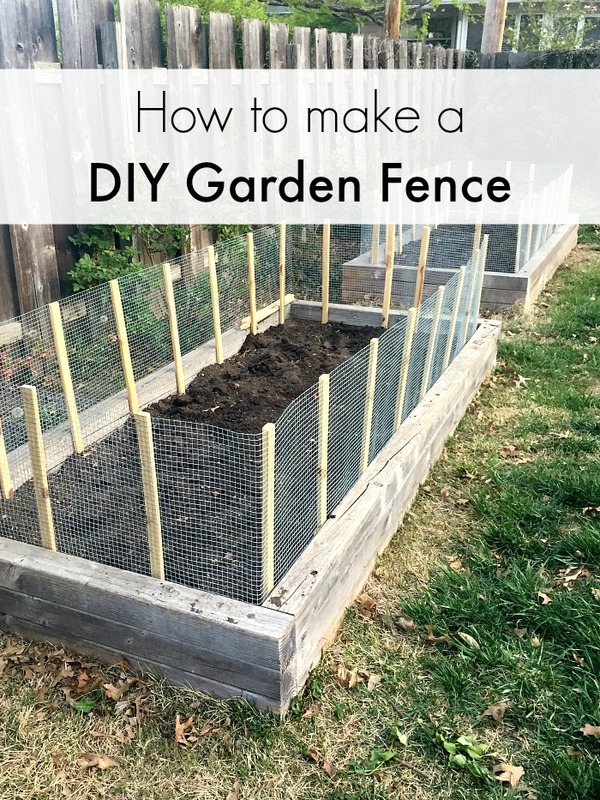 I should also note that, while our fence is for a raised garden bed, it would probably work for a non raised bed by pounding the stakes into the ground. I have no idea why the previous owners tiled all the walls and ceiling in the powder room. Was that a thing for a while? So. Much. Tile. 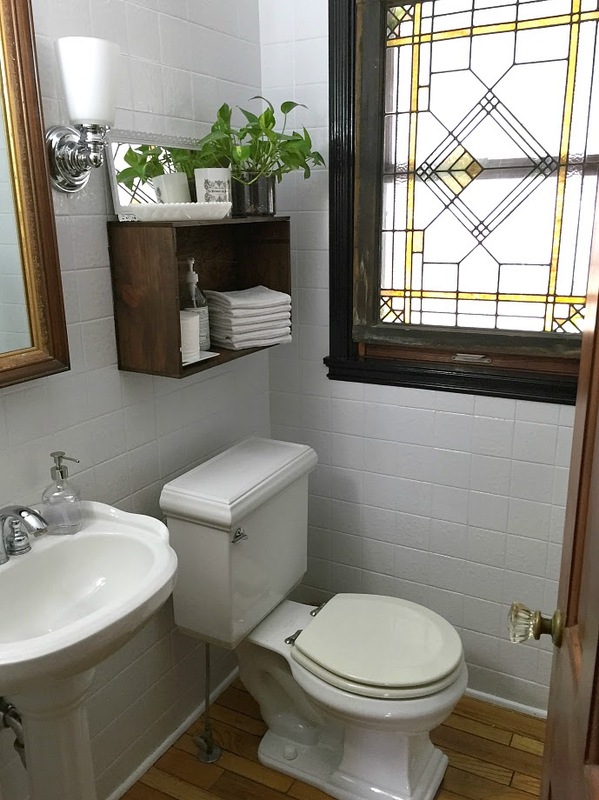 Aside from the dated tile, the rest of the powder room was do-able; the sink and toilet are a newer style that suits us fine and the wood floors that continue from the kitchen are so pretty! We were making plans to tear out the tile and replace it with drywall, but then I got a wild hair and decided to try painting it instead. I figured painting the tile would be a cheap experiment and if it didn't look right, we could go ahead with the drywall. First, I scrubbed the walls with TSP and let them dry overnight. Then, I used an oil based primer followed by an oil based gloss paint. I rarely use oil based paint however, in this case, I needed something with high durability and shine. I did all the painting while Jesse and B were up in Omaha, which was good because oil based paint is so stinky! If you try painting tile (and you should!) be sure to open all the windows and wear a respirator! 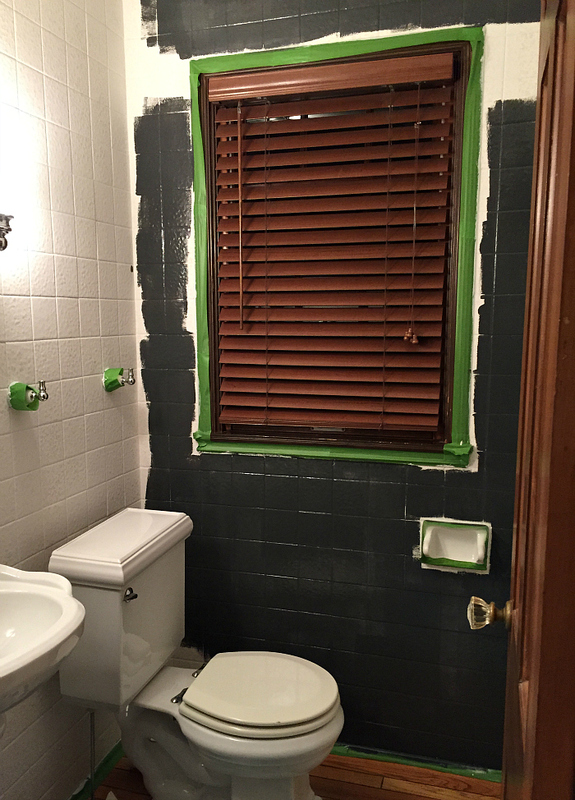 I wasn't entirely sure if I wanted to paint the tile gloss white, or go bold with a charcoal gray. After a bit of waffling, I started in with the gray, and chickened out part way through...I'm no expert, but I've painted enough rooms to know that if you get a wall mostly done and start to feel nervous, it's time to bail! It took a few coats to cover the gray paint, but I love how the gloss white turned out! The antique stained glass window was a gift from my parents a few years ago and previously hung in the entry of our Omaha house. Full disclosure: We hung up white blinds first, which looked completely "off," before discovering the stained glass window fit perfectly. 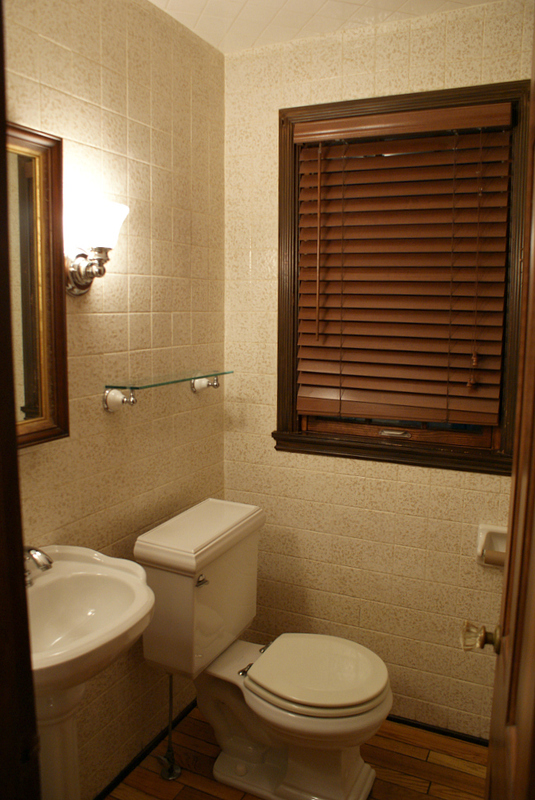 The window faces our backyard, so privacy shouldn't be an issue; bladder shy folks could always use the bathroom in the snug. I also painted the trim around the window gloss black, and plan to paint the interior portions once the weather warms up. 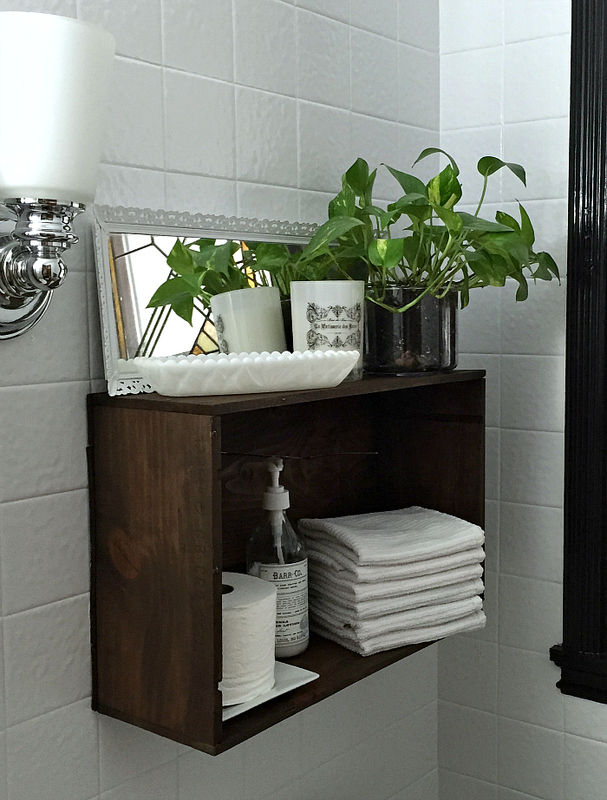 The shelf above the toilet is a wine crate that I picked up at a junk shop for a few dollars. I lightly sanded the crate to remove any potential slivers and applied a bit of walnut stain. I styled the shelf with baubles from around the house, plus extra toilet paper, lotion, and a stack of hand towels for guests. I'm completely smitten with how our powder room turned out! 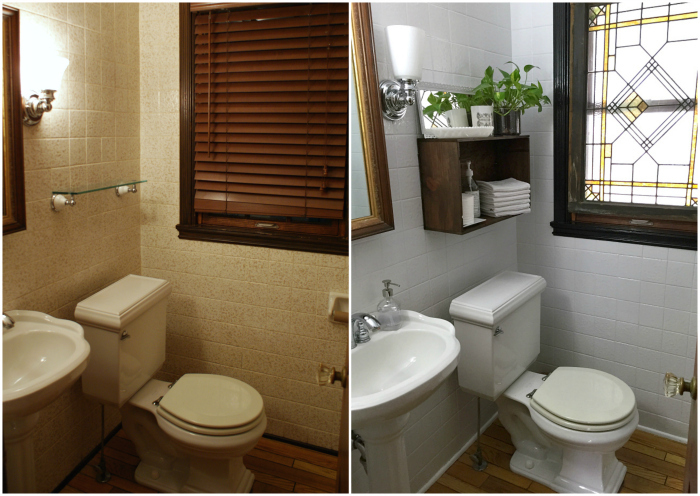 Painting the tile and adding a few accessories was much faster and more budget friendly than all new drywall. Overall, we spent less than $150 (including the blinds we didn't use). I would note, however, that if you had to purchase a stained glass window and a few accessories, the makeover would probably be closer to $400. Part of me wishes I was brave enough to have gone through with the dark gray paint, but the finished result is so lovely that I'm okay with it! Have you ever tried painting tile? How'd turn out?